By now most people have probably heard about the tutus. In fact, the tutus are probably old news. Running in the Montreal Half. My first race with my Glam Runner tutu. The Internet seemed to explode with disappointment and outrage at the end of March when SELF Magazine made fun of Monika Allen and Taramae Baize for running in tutus in the LA Marathon. Unknown to SELF Magazine, Monika Allen was undergoing chemotherapy for brain cancer at the time. She also makes and sells tutus (through her side business Glam Runner) with all proceeds going to nonprofit running program Girls on the Run. I bought one of her tutus in 2012 and have been wearing it proudly ever since. 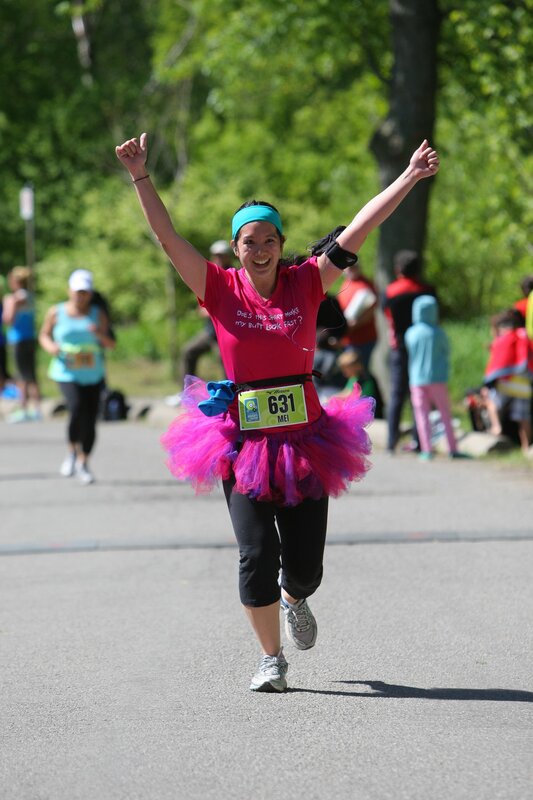 Running in my Glam Runner tutu at the Toronto Women’s Half. As I’ve been following the story, I’ve been really impressed by how Monika and Glam Runner have managed to turn this negative coverage into something very positive. First, they expressed their disappointment at SELF Magazine for making fun of the photo. SELF Magazine had contacted them asking for permission to use their photo, but hadn’t explained how it would be used. Who wouldn’t be excited that a health and fitness magazine wanted to publish their running photo? I’d be super excited! I can only imagine how they felt when they saw what SELF did. It would be easy to be spiteful and angry and ask readers to boycott SELF. Instead, Monika remained positive and used this publicity to raise awareness for Girls on the Run. When I last checked, Girls on the Run had received over $4,000 in donations as a result. I think that’s pretty amazing. I’m also happy that of all runners in tutus to pick on, that SELF chose Monika. This may sound odd, but I’m glad it was her because she was able to bring a lot of attention to this issue. Why was SELF Magazine even making fun of runners in tutus to begin with? As a women’s magazine, why were they promoting making fun of other women? Who cares what somebody wears to a marathon? They’re running a marathon. Shouldn’t we be proud of anybody who starts to run at all? It’s not easy to start or to get to the point of running marathons. I still don’t find it easy and I’ve been running for 3 years. Since this all happened, the editor of SELF Magazine has apologized to Monika and Taramae and even announced that the BS Meter column where the photo appeared would be discontinued. I think that’s definitely a step in the right direction. SELF also apologized to Monika and interviewed her to learn more about her and Girls on the Run. I was really impressed by how Monika and Taramae handled all of this. 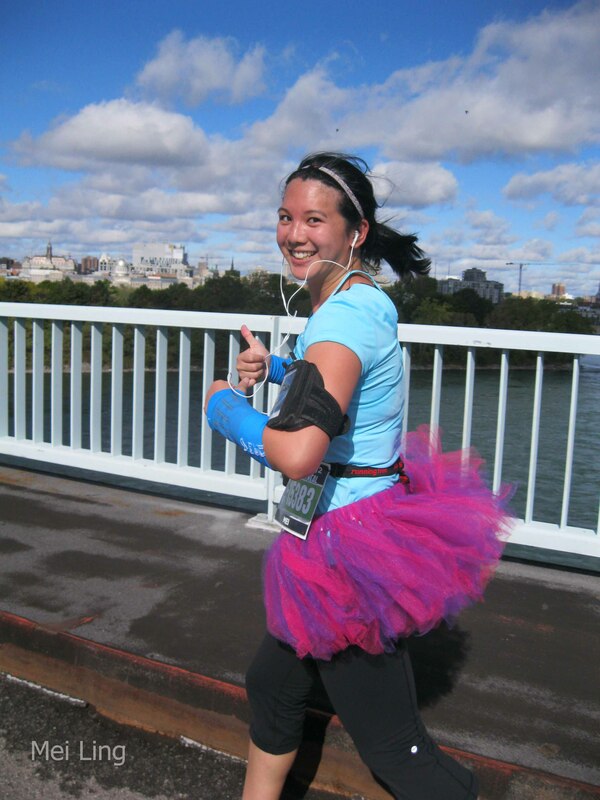 Knowing the backstory behind my Glam Runner tutu will continue to inspire me while I’m running. Wearing my Glam Runner tutu at the Monster Dash 10k. So why do I run in a tutu? I originally bought my tutu for the Disneyland half, but I didn’t order it in time. Instead I wore it to the Montreal half three weeks later and loved it. It was so much fun! Strangers cheered for me in French “Belle tutu! Belle ballerina!” When I wore it again in the Toronto Women’s Half, again strangers cheered, kids complimented me and a volunteer even ran with me for a bit because we were “both dressed up.” In short, running in a tutu is fun. Do you ever dress up when you run? Or wear anything fun or different? (I’m even thinking of the wings Kelly wore on her shoes for Around the Bay) If so, share in the comments. I’d love to hear about it.